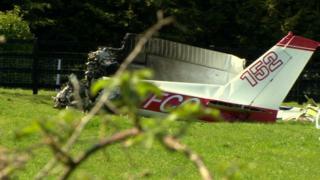 A plane that crashed in County Antrim last year stalled when flying at a low level and low speed, a report has concluded. Bryan Greenwood from Larne and Bob Farmbrough, originally from England, died in the crash on 19 April. The Cessna 152 came down and caught fire between Nutts Corner and Loanends. The report said there was a critical reduction in airspeed "for an undetermined reason" before the crash. Mr Greenwood, who ran a photography business, was taking aerial photos of properties in the area before he died. Mr Farmbrough, a retired commercial airline pilot who lived in Carrickfergus, was at the controls of the two-seat light aircraft. According to a report from the Air Accidents Investigation Branch (AAIB), the aircraft was "flying at low level and low airspeed when, for an undetermined reason, there was a critical reduction in airspeed and a loss of control". Witnesses on the ground saw the aircraft circling. Several reported seeing it flying apparently normally before suddenly "nose-diving" to the ground. Two witnesses also reported hearing the engine "spluttering" as the aircraft passed overhead at a low height. The report added: "There is an increased level of risk associated with flying close to the stalling speed without sufficient height to recover from a stall, particularly when focussed on a task such as taking aerial photographs." A risk assessment should have been carried out because the plane was used for aerial photography, but the AAIB said there was no evidence of this being done. The aircraft, rented from the the Ulster Flying Club, took off from Newtownards Airport at 10.47 BST and flew in a north-west direction. The last radio communication between the pilot and air traffic control was at 11.17 BST, with the final radar point recorded two minutes later. Mr Farmbrough was a highly experienced pilot who worked for a number of airlines, including Inter European Airways, Airtours International Airways and British Regional Airlines - which operated British Airways flights from Belfast. The pair had flown regularly together for 14 years. Since the accident, the Ulster Flying Club in Newtownards has issued instructions to their pilot members to remind them of their responsibility "to understand and comply with the privileges of their licences and ratings".